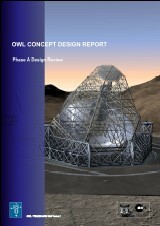 The phase A design report (OWL Blue Book) is now available on-line. Click on the thumbnail right to download the entire book (pdf file, 32 MB) or follow the links below to individual chapters. Please note that Chapter 16 (Management) and Appendix 6 (Cost Estimates) are not available in this public release as they contain proprietary information by industrial suppliers. The OWL Phase A Review, summarizing the outcome of the conceptual design phase, was held at ESO Headquarters in Garching on November 2 to 4th. The first day was open to the public, the second and third days were devoted to presentations and discussions with a panel of international experts. Overheads of the presentations made on the first day are provided below. Thanks to all who participated in this major event.